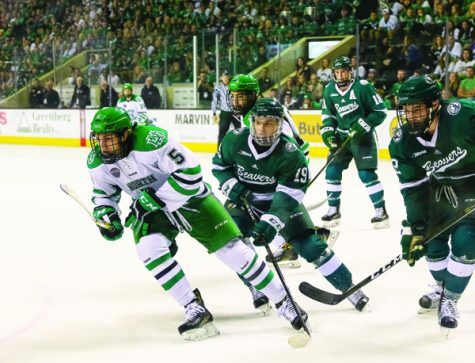 2019 marked the first time in the National Collegiate Hockey Conference history that the University of North Dakota did not appear in the NCHC Frozen Faceoff and the second straight season UND has missed the NCAA tournament. This caps off a season that showed promise at times but ended too short. 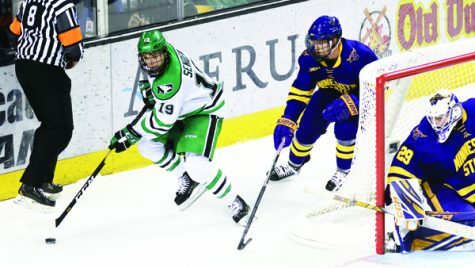 While UND did not appear in the tournament, the North Dakota faithful were seen from any camera angle in full UND apparel supporting the NCHC and college hockey regardless of UND missing the NCHC Frozen Faceoff. The four remaining teams put on a show for the fans in attendance and watching on NCHC.tv. No. 1 St. Cloud State University, No. 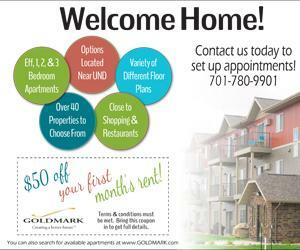 2 Minnesota Duluth, No. 4 Denver and No. 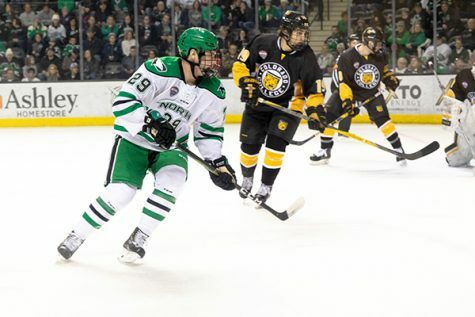 6 Colorado College were the final four teams in the NCHC to battle in the NCHC Frozen Faceoff. The tournament began with sixth ranked Colorado College facing off against top seed St. Cloud. After five years, Colorado College made their first NCHC Frozen Faceoff appearance which was a bright spot for the future of the program. St. Cloud made their fourth appearance and their second straight season as the top seed in the NCHC. In each appearance, St. Cloud has made the championship game, winning once. This being said, St. Cloud was looking to make the championship game once again. Colorado College scored first half way through the first period. St. Cloud responded with two goals 30 seconds apart three minutes later. St. Cloud added two more goals before Colorado College finally responded late in the third period after giving up four unanswered goals. St. Cloud added one more for good measure, moving onto the championship game with a 5-2 victory. Fourth ranked Denver would take on the two seed Duluth. 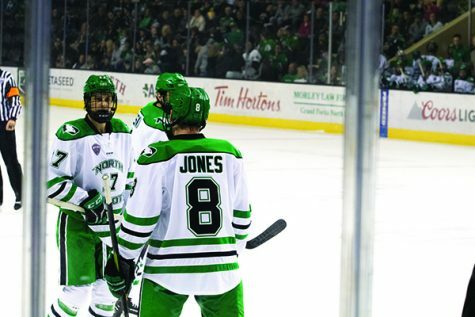 Denver was appearing for the sixth straight season and is the only team in the NCHC to compete in the Frozen Faceoff every year since the inception of the NCHC in 2013-2014. Denver has finished third three times and has won the NCHC Frozen Faceoff twice. Duluth was appearing for the fourth straight year after missing the first two years. Duluth has been a contender each of those four seasons. Duluth has won once (2017), finished second (2016) and fourth (2018). Despite the tough matchup, Duluth shut-out Denver’s offense 3-0 advancing to face St. Cloud in the championship. Cross-state rivals battled for bragging rights and third place. Denver and Colorado College’s rivalry was on the main stage. After a close first period ending in 1-1, Denver opened the floodgates come the second and third period. Boasting five goals while keeping tight in their own zone. Denver won the third place game, 6-1, for the fourth time in their history. 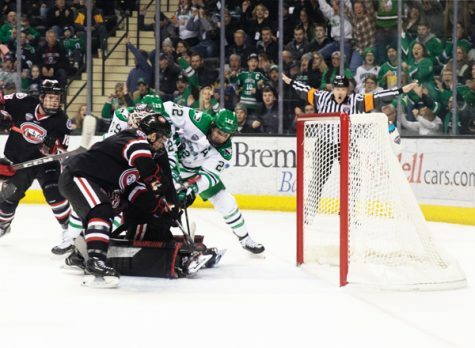 Saturday night marked a NCHC championship game for the ages. 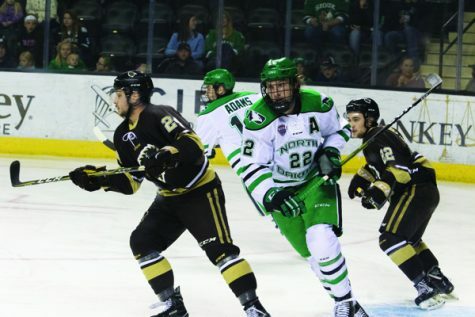 For the second time in NCHC history, and second straight season, the number one and number two NCHC teams were the final two remaining battling for NCHC supremacy and auto-bid into the NCAA tournament. Duluth and St. Cloud exhibited NCHC hockey at its finest. St. Cloud struck first 7:45 into the first period and Duluth responded three minutes later. Both teams went scoreless until the third period. Twenty-eight seconds into the third, St. Cloud State capitalized on the powerplay taking a 2-1 lead. Fifteen minutes later, on the St. Cloud would be on the powerplay for the sixth time, except this time Duluth scored a short-handed goal to tie the game at two. Special teams ended up being the difference maker in the game. St. Cloud went 1-for-6 on the powerplay. Duluth went 0-for-3 on the powerplay, but scored a short-handed goal. Both teams tightened up their games for overtime. After 20 minutes of overtime showcasing excellent hockey play and exciting back and forths, a second overtime was needed. Duluth found the back of the net 7:29 into double overtime when sophomore, Nick Swaney, scored his 15th and biggest goal of the season. 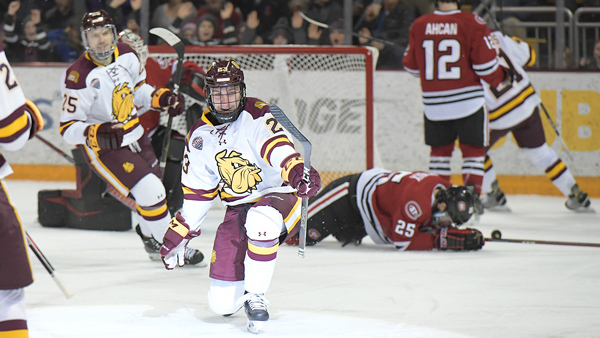 Duluth was crowned NCHC Frozen Faceoff Champions for the second time, after 87 minutes and 29 seconds of hockey. St. Cloud finished second for the third time in their history.